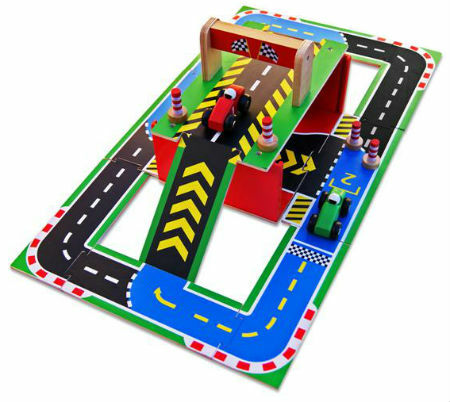 The very clever thing about this set is that the carry case is part of the road and ramps. So when you have finished playing you can pack it all away into itself and carry it wherever you like. The inside of the carry case is the petrol and service bay and the top of the case becomes a road leading to ramps at either end. A very clever design. Size: Rectagle of track is 68cm long x 37cm wide. Packed carry case is 28cm long x 12 cm high x 18cm wide. We like this because: "Very well designed. Love the way the track forms the sliding door of the carry case."